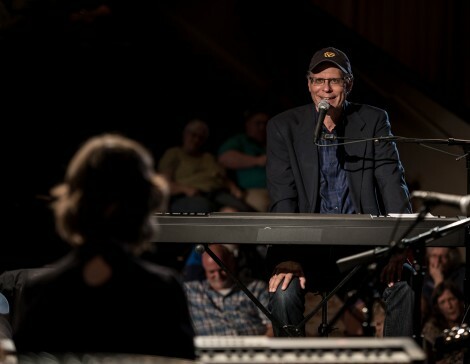 Season three of the show, which spotlights accomplished singer-songwriters, will debut locally at 11 p.m. Jan. 21 on WOSU-TV. The show is distributed nationally by American Public Television (APT) and currently is aired on more than 140 stations around the country. Gnezda, a 1979 Ohio Wesleyan graduate, is the show’s creator and host. He talks about “Songs at the Center” in the January edition of Ohio Magazine. In addition to his work on “Songs at the Center,” Gnezda also is collaborating with the Greater Columbus Arts Council in support of its Columbus Makes Art project, and he will be the featured presenter at 3 p.m. Jan. 28 at Gramercy Books, Bexley, where he’ll blend his music with readings from his 2009 memoir, “The Safe Life,” a narrative about growing up with a disabled father. Other presenters at the bookstore event will include fellow OWU graduate and poet Maggie Smith ’99, who earned international acclaim over the summer for her poem “Good Bones.” The poem was shared by thousands of people via social media following the Pulse nightclub shootings in Orlando and is scheduled to be featured April 9 in an episode of CBS TV’s “Madam Secretary” starring Téa Leoni. Learn more about Gnezda at http://gnezda.com, more about “Songs at the Center” at http://songsatthecenter.com, and more about Ohio Wesleyan’s journalism, communication, and business administration majors at www.owu.edu/majors.